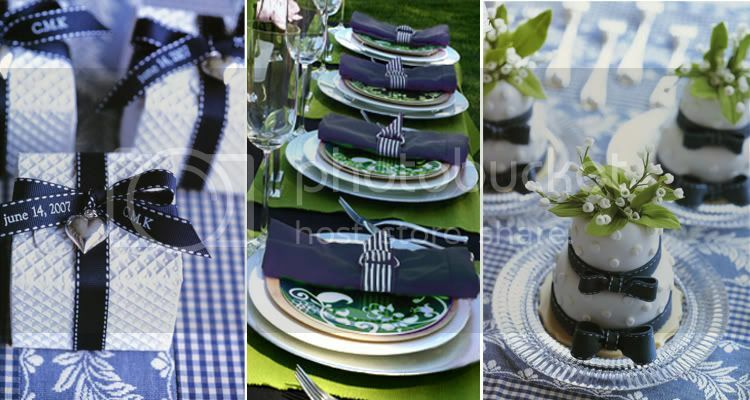 Toast and Tables: Who, What, Ware: Tablesetting inspiration for Elizabeth from "Tie the Knot"
Who, What, Ware: Tablesetting inspiration for Elizabeth from "Tie the Knot"
Who: I’ll like to introduce everyone to Elizabeth from “Tie the Knot”. 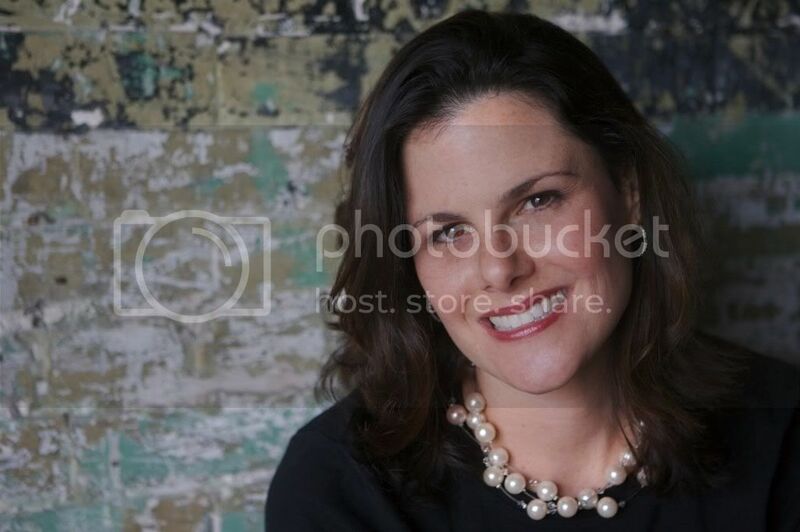 Liz is a bride-2-be from Diamondhead, MS who currently lives in Shreveport. Liz moved to Shreveport when she got engaged to her future husband, David, and then ... he moved to Iraq. Liz is in the process of planning her wedding (check out her progress here) and counting down the days until her FH comes home in December. 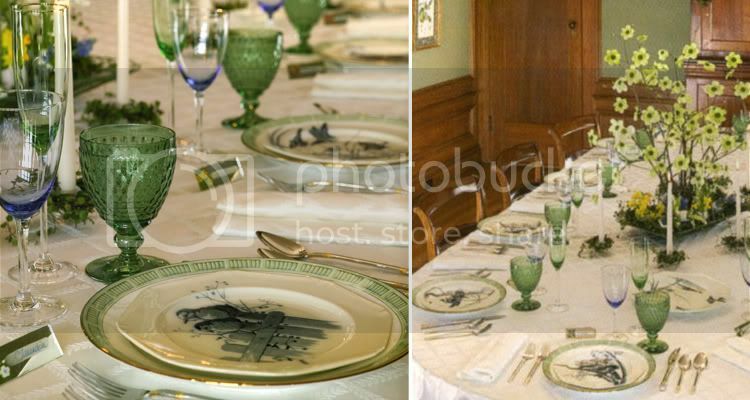 What: “The Reception” – Liz sent me a nice note asking if I would post on the navy, white and green tablescape that she is trying for. I happily responded, yes, of course, us future brides have to stick together! 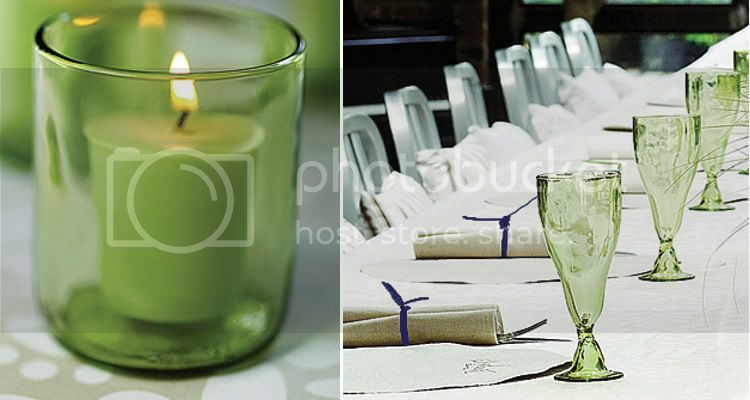 Jessica Lynn from "Tying the Knot" is also looking at a blue and green color theme. 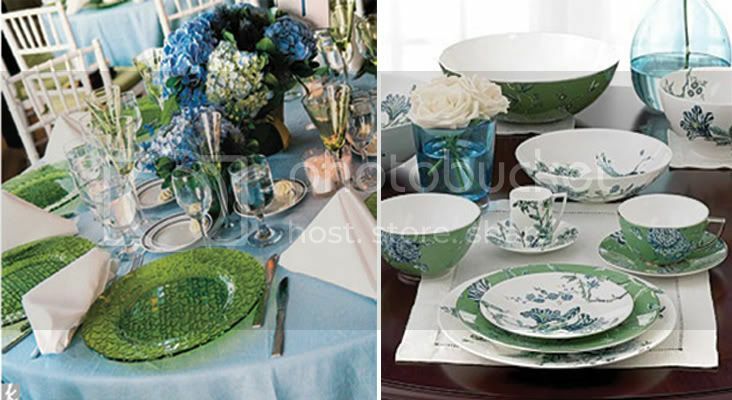 Ware: Blue is one of the most popular colors used for setting the table. Summertime often calls to mind the particularly dark, rich shade of blue: navy. And no wonder: it’s the color of the ocean waves and it’s the color that’s been used for years when decorating a beach or nautical theme table. 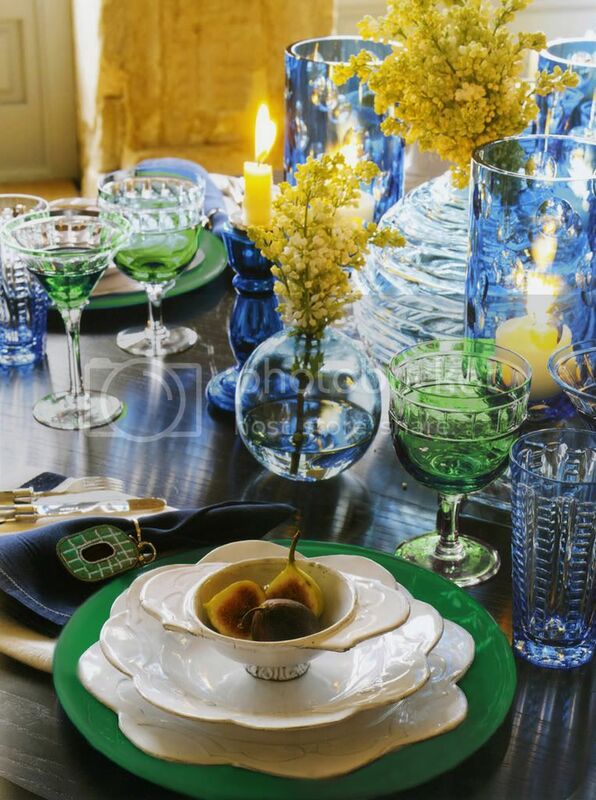 I think mixing the tableware with blue and green is a great idea. Blue and all it’s variations are a very popular color combination with green because they symbolize nature and reflects our renewed interest in the environment. You need only to look at the sky, the ocean or distant mountains to understand the nature of this combination. 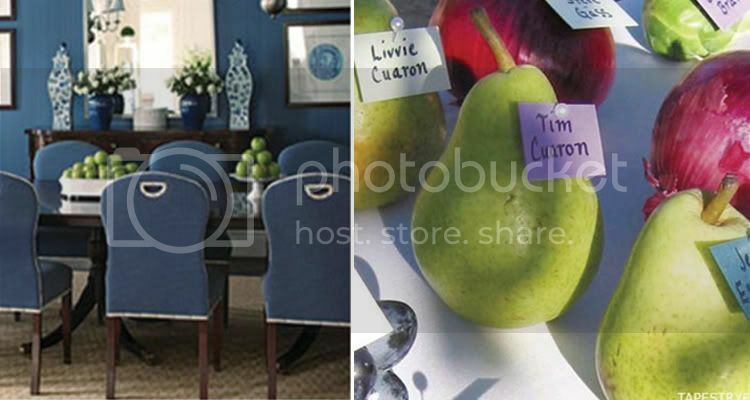 The environment and nature are the inspirations behind this post - - - the bright sunny skies, fruit and vegetable centerpieces, and colored stemware that are reminiscence of the glittering seas. 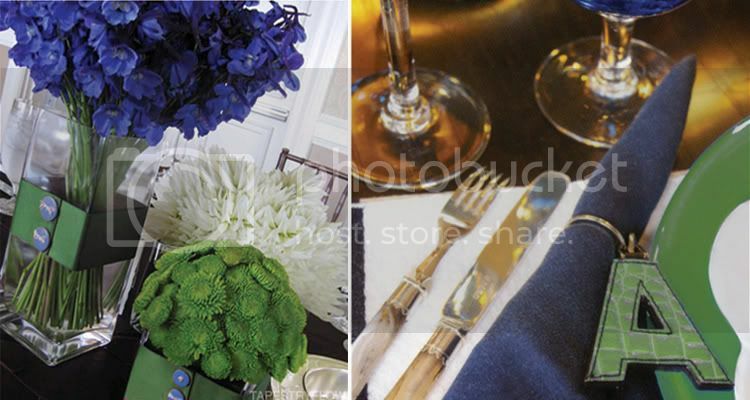 Images: The Knot, Brides, Style me Pretty, The Perfect Table, At Home with Carolyn Roehm, House Beautiful magazine and The Chic and Sophisticated Bride. Wow!! I knew you woud find amazing things, but wow!! I love it!! It's so good to see what others can find when your stuck! Thank you sooooo much!! Beautiful ideas Sarah! Also check out Knottie Cnickler's bio - she had an amazing blue and green wedding! Liz, so glad you liked this post and that I could be of some assistance.I hope this provided you with some inspiration and great ideas! The color combination of blue and green just works beautifully! And just about any blue-green duo works well. So even if you decide to use something other than navy - - - variations like aqua, turquoise, cobalt and cerulean would still go great with green. Can't wait to see how everything turns out. I'll be checking your blog. Erin, thanks for the link to Knottie Cnickler's bio. Yes, you're absolutely correct, her blue and green wedding was gorgeous. Another great example of how just about any varation of blue works well with green. I do believe Knottie Cnickler used a ultamarine blue. When paried with green it was simply stunning! Oh Jessica you're welcome! I know you really love the blue/green color combination and you were thinking about changing it because you didn't think it would work. It works! It works! If you love this duo, stick with it. I hope this post provided some inspiration. This is a fabulous post its filled with ideas that can be personalized to their wedding. these are all lovely - and will be so cool and fresh. We did a 50th birthday for my sister-in-law in blue and white in August and it was just right. Love, love, love the Wedgewood. I love your site! I found it through Brillian Asylum. I will definitely be checking it regularly! Mind if I add you to my links? Love this! The Green and blues are just gorgeous!It totally works! Another great post! Mrs. B - I bet your sister-in-law's b-day party was wonderful. You can never go wrong with blue and white tableware. From traditional to modern or a combination of the two, it's always just right. 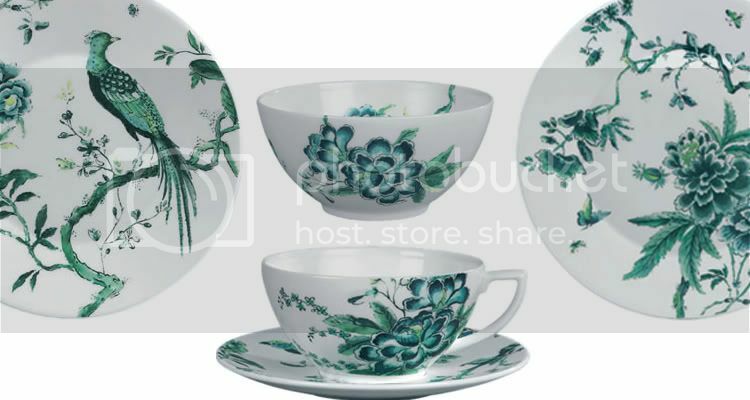 That's why I love the Wedgwood's Chinoiserie pattern by Jasper Conran - - - this garden-inspired pattern combines traditional artistry with a contemporary sense of color and design. Mixing in these pieces would add just the right amount of drama to the table. Laura, I would be honored if you linked in. Thanks so much for stopping by (via BA) and I'm glad you're enjoying the site. I checked your site and I must say, that monogrammed dinnerware is fabulous! Melissa thanks for the compliment, I'm glad you enjoyed the post. It's always a pleasure when people in the wedding planning business chime in; because so much of what you guys do inspire me! I can provide the inspiration but you guys actually bring a bride's vision to life and I think that's an awesome ability! 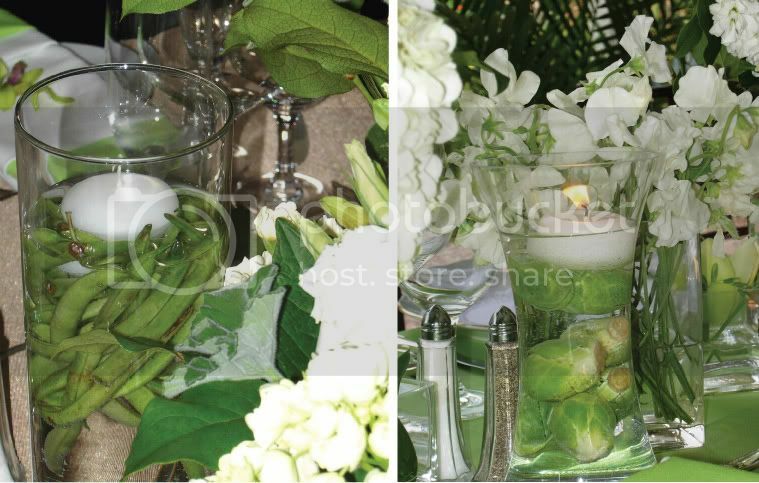 I LOVE the submerged green bean & brussel sprout centerpieces. Cute, cute, cute! Oh, Sarah...thank you so much for making Liz's day. Your tablescapes are breathtaking! You must have inside connections to the design world. Where in the world are you? amazing table settings. blue and green is one of my favorite color combinations. the mini cakes are wonderful! Absolutely stunning. I have to agree the blue is my favorite here as well. I love that one dish that has the bird on it.